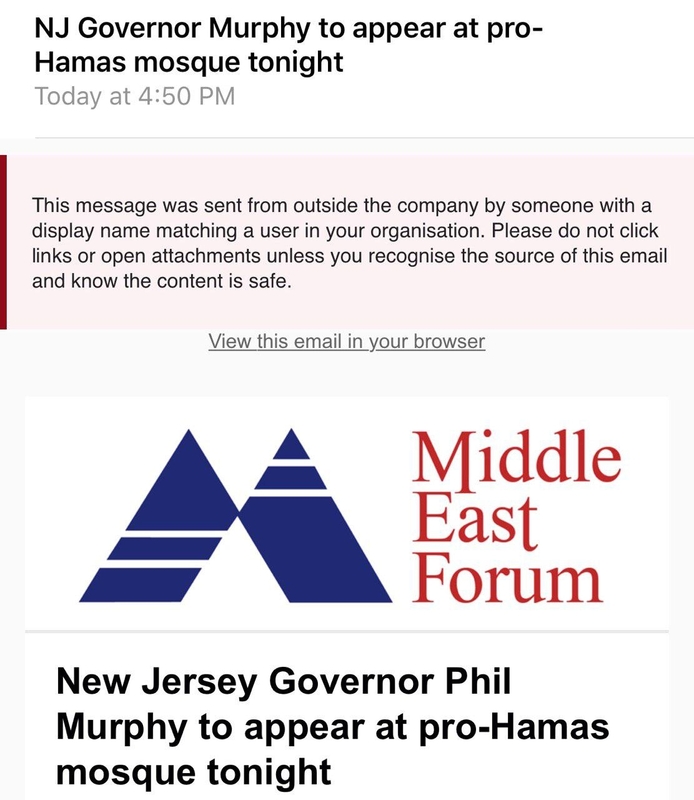 At 4:50pm this afternoon, the Middle East Forum sent out an urgent notice to our readers expressing our alarm that New Jersey Governor Phil Murphy planned to conduct a State of the State town hall event at the Islamic Center of Passaic County (ICPC) in northern New Jersey tonight—a mosque with a long history of pro-Hamas leadership. The ICPC's imam, Mohammed Qatanani, has deep connections with terrorist groups. His own lawyer admits that he was a member of the student chapter of the Muslim Brotherhood in Jordan, and the N.J. Office of Homeland Security and Preparedness identifies Qatanani as a Hamas supporter. Qatanani is currently fighting deportation on the grounds that he lied to federal officials about his Israeli conviction for membership in Hamas. Mere minutes after we sent our release, the Council on American-Islamic Relations' New Jersey branch (CAIR-NJ) issued an announcement saying that the event had been postponed "due to unforeseen circumstances." We called both Governor Murphy and the ICPC to ask for comment on the postponement, and left messages with both offices. 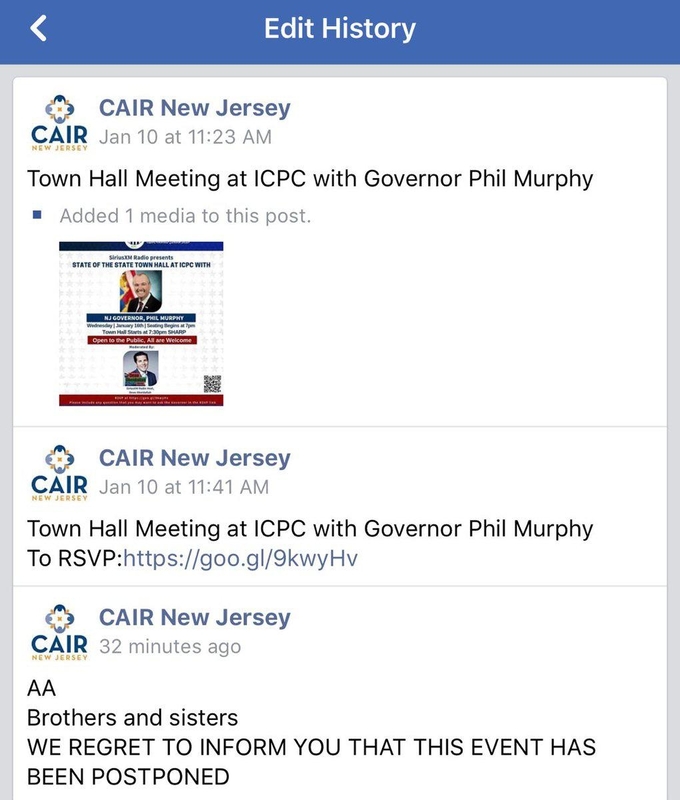 We also contacted CAIR-NJ and CAIR-National to ask for comment on Qatanani's terrorist connections, and his history of anti-Jewish, anti-Christian, and pro-Hamas statements. Neither CAIR-NJ nor CAIR-National has condemned Qatanani's remarks. We will update this post with any CAIR comments. The Middle East Forum welcomes Governor Murphy's decision to cancel his appearance at ICPC tonight. Of all the mosques in New Jersey, it is vital that politicians do not embrace the one run by an anti-Jewish extremist cleric accused by the federal government of links to the designated terror group Hamas.